Here it is.. our first Guest Blog of the next few weeks. 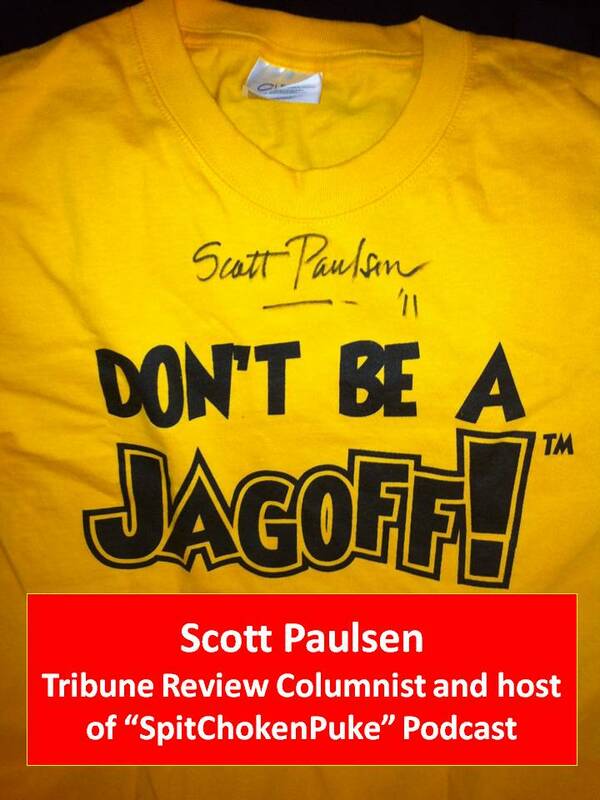 Please welcome, Scott Paulsen, radio announcer, Spit Choke n Puke podcaster and writer for the Tribune Review. It’s time to give thanks for all the things we have and all the things we somehow avoided. First, I am thankful for my health. I am thankful that I do not suffer from carbuncles. I don’t even know what carbuncles are. But they don’t sound good. So I am thankful that I do not have them (as far as I know). Likewise, shingles. Or a goiter. catheter. Although, from what I’ve been told, both are a certainty that comes with being a boy. I am thankful that I do not work in the healthcare field; that when, indeed, carbuncle come calling, or shingles, or a goiter, that I can visit someone else who will lance it, drain it, clean it, rub ointment, bandage it and send me on my way. Thank you, whoever you are, who made that career choice. I am thankful that I am vain enough to wash and comb my hair on a regular basis, yet not so vain as to have it replaced with plugs, a rug or spray paint as it falls out. I am thankful that I am vain enough to pass on that second helping of lasagna and keep from becoming a fat pig, yet not so vain as to eat handfuls of mall store growth stimulants to try and look like guys who are 20 years younger. I am thankful that I am not 20 years younger. I am thankful to be the perfect age – too young for Viet Nam; too old for Iraq. I am thankful this Thanksgiving for turkey. I am thankful for stuffing, for pumpkin pie and for coffee, the only legal drug. I am thankful that my curiosity allowed me to try the drugs that were not legal, but did not push me to try the ones that are deadly. I am thankful to not be one of those poor people you see on television ads who suffer from anxiety disorders, gastric disorders and unnamed disorders that send them to ask their doctor about whatever new pill is on the market. I am thankful that I do not suffer the side effects of that new pill, which may include oily, bloody discharge. I am thankful that I do not need Viagra. I am thankful that there is someone else who is glad I do not need Viagra. Yet. I am thankful for the ability to read. I am thankful to have read Gene Collier, Hunter Thompson, Rob Rogers, David Sedaris and a host of other subversive minds. I am thankful for friends; especially those who own backhoes. I am thankful for plumbing. I am thankful for the fact that I am advanced enough to embrace new technologies, yet remain primitive enough to stare at the moon every night and wonder. I am thankful I do not have carbuncles. I am thankful that I do not repeat myself as older people do. Yet. I am thankful for the Beatles, the Rolling Stones, Charlie Parker and that song they used to play on the Muppets Show. You know the one. Manamana. Do do do do do. Manamana. Do do do do. I am thankful for the Twist, the Hokey-Pokey and the Bird Dance. I am thankful that Sid Crosby ended up in Pittsburgh, that James Harrison has an outlet for his aggression and that once, when I was much younger, I could reach the rim. Which rim I’m speaking of is up to you to decide, Ya Jagoff! Scott has also autographed one of our shirts for auction, you can find it here. Previous articleHappy Thanksgiving – Announcing Our Online Auction!!! Next articleGuest Blog – SteelerGURL, THANKFUL….